Anna and her husband met at a nomad meetup in Medellín, Colombia, and they’re now expecting a nomad baby! 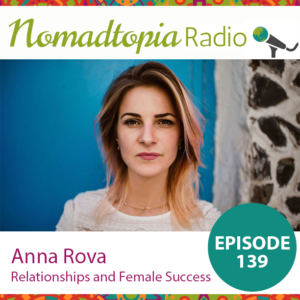 In this episode, we talk about Anna’s perspective on relationships, the reality of nomad life, embracing one’s wild feminine nature, and so much more. Note: Links with an asterisk are affiliate links, which means I may earn a small commission if you purchase something using that link. There’s no additional cost to you, of course! Thanks for supporting Nomadtopia.